Gamification integration into health education has the benefit of increasing utilization by patients. 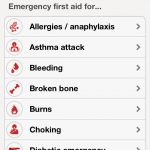 The American Red Cross App has created an app to help users learn first aid and then practice their knowledge through games. Completion of these Q&A games leads to awards that can then be posted to the Apple Game Center.